There are many good newsletters out there [like Jonah Goldberg's G-File], but in my opinion the number one political newsletter is Jim Geraghty's "Morning Jolt." 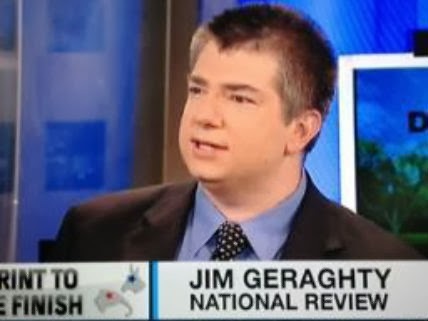 Jim Geraghty posts articles on National Review Online's "Campaign Spot". Jim Geraghty is a journalist deluxe in evaluating the political landscape in America and in interpreting polls. He is the man that Hugh Hewitt brings on his radio show to evaluate a race or how a particular campaign is going. In fact, Hugh Hewitt has given him the moniker of "Mr. Indispensable." To receive Jim Geraghty's Morning Jolt in your e-mail every day click here and look on the right side for the tab that says: Receive Your Free NRO newsletters. Then when you submit your e-mail you will get to choose Jim Geraghty's Morning Jolt and any other you would wish to recive. I would highly recommend it. In fact, I would recommend selecting all of the newsletters from National Review Online as they are all good.